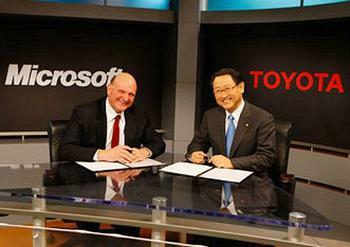 REDMOND, Washington, April 7, 2011 (ENS) – Toyota and Microsoft are partnering to build a system that links electric and plug-in hybrid vehicles, people and smart center energy-management systems. The world’s largest auto manufacturer and the world’s largest software manufacturer announced Wednesday that they will work together to build a global platform for Toyota’s telematics services using the Windows Azure cloud computing platform. Telematics is the combination of telecommunications and information technologies in vehicles, including GPS systems, energy management and other multimedia technologies. Cloud computing delivers easy, scalable access to computing resources and services over the Internet. At a news conference at Microsoft headquarters in Redmond on Wednesday, officials of the two companies said they plan to participate in a one billion yen (US$12 million) investment in Toyota Media Service Co., a TMC subsidiary that offers digital information services to Toyota automotive customers. “Or a customer could use a smart phone to check battery power or maintenance information remotely,” Ballmer said. “To achieve this, it is important to develop a new link between vehicles, people and smart center energy-management systems,” said Toyoda. As part of its smart grid activities, aimed at achieving a low carbon society through efficient energy use, Toyota is conducting trials in Japan of its Toyota Smart Center pilot program, to link people, automobiles and homes for integrated control of energy consumption. “This new system will include advanced car-telematics like virtual operators with voice recognition, management of vehicle charging to reduce stress on energy supply, and remote control of appliances, heating and lighting at home,” Toyoda said. Toyota’s goal is to establish a complete global cloud platform by 2015 that will provide affordable and advanced telematics services to Toyota automotive customers around the world.